Although Amir Khan’s public campaign to be Floyd Mayweather Jr.’s next opponent didn’t quite work out the way he wanted — Khan and Mayweather are scheduled to fight on May 3, but Khan will be facing Luis Collazo on the undercard of Mayweather’s main event against Marcos Maidana — the two-time light-welterweight world champion isn’t giving up his quest to get a crack at the world’s best and most popular boxer. Khan is just going about it in a way that makes him look kind of silly. 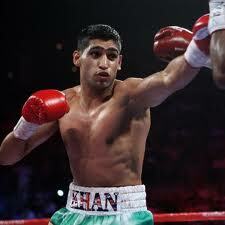 According to India’s Zee News, Khan recently told Mayweather that he will never be a “global star” unless he fights him. That claim is based on Khan’s popularity in lucrative markets such as India, Pakistan and Dubai. Khan was raised in a Muslim family in England but has Pakistani roots. The thing is, Mayweather already is a global star. The Olympic gold medalist and eight-time world champion (across three weight classes) has never fought as a professional outside of the United States — even his Olympic run took place in Atlanta — but he’s nonetheless the most popular fighter on the planet and a celebrity in any country that follows boxing. A Mayweather-Khan fight will do more to raise Khan’s public profile than Mayweather’s, which is the case with every Mayweather opponent. Khan knows that, and that’s why he’s been lobbying so hard to get Mayweather in the ring.